Discussion paper considers role of regional airports. The Airports Commission is today (9 June 2014) calling for evidence on the connectivity and business models of the UK’s existing airport capacity. The publication considers the national aviation picture from which the Commission is considering the shortlisted options for additional capacity in London and the south east. This call for evidence focuses on the domestic and international connectivity provided by regional airports and airports serving London and the south east other than Heathrow and Gatwick, and considers what recommendations the Commission could usefully make to shape this national picture. Regional airports and those in London and the south east other than Gatwick and Heathrow remain critical to the Commission’s analysis; it is clear that in the future these airports will play a crucial national role, especially at a time when the major London airports are operating very close to capacity. The publication further examines connectivity trends at these airports, how the business models of these airports are developing and whether the connectivity provided by these airports can be enhanced. 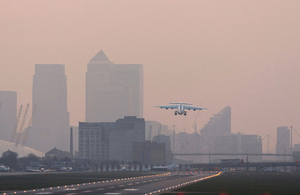 Contribute to the consultation: The utilisation of the UK’s existing airport capacity.